Merddin was converted from an oil burner to be coal fired for the 2007 season. High expectations weren't met and he proved to be an indifferent steamer, heavy on both coal and firemen. It was erratic too, as one day with one driver and fireman it would perform poorly and the next day it would be fine. Over the summer it became apparent there were two problems, poor draughting and something wrong with the valves. The poor draughting made getting the fire just right extremely important with the constant need to keep under the doors and under the arches well filled with coal or it wouldn't steam. Observing from the drivers side the secret seemed to be to attend to these areas from the ground during each station stop. The valves showed themselves up with the fact that with an 8 car train it would happily pull the train with the reverser in mid gear once you told it which way to go. 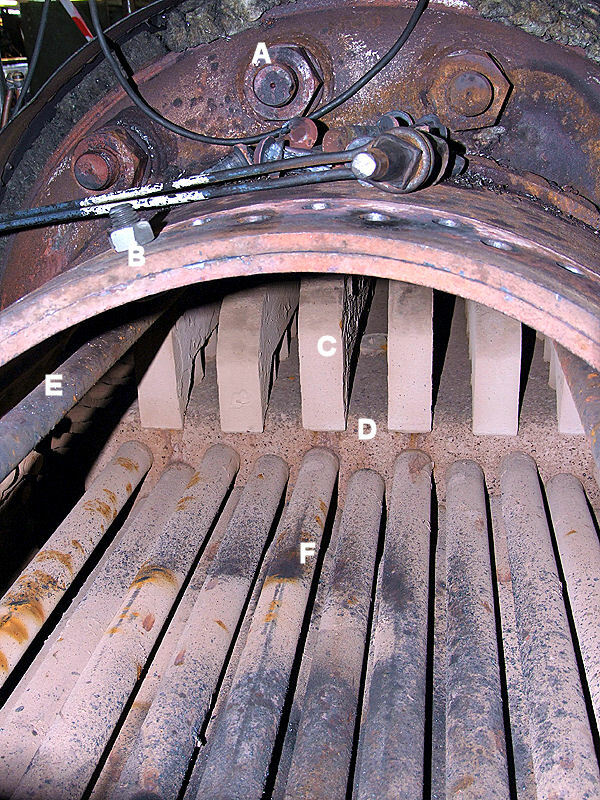 This indicates the cylinders were getting lots of steam even when the valve gear was supposedly in mid gear [neutral]. This is lead steam and comes from the valves opening to admit steam in advance of the timed point. Lead steam is usual but this much was ridiculous. The effect of this much lead steam was that if you ran the engine in its "usual" notch you were using masses of steam pretty ineffectually resulting in the high coal and fireman consumption. If you pulled it up further in to higher notches it used less steam more efficiently. My personal experience was that it was quite happy on 10 or 11 coach trains with the reverser in the top notch [one down from mid gear]. The 2008 season started with high hopes for Merddin. The valves had been looked at, found to be manufactured wrongly and corrected. Liners were fitted to the chimneys to improve the draughting. 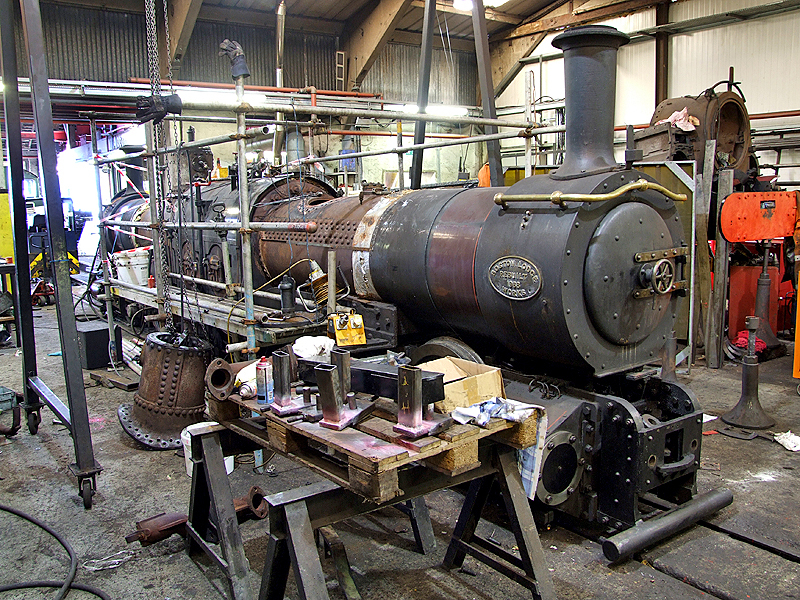 Merddin and the Earl were to be the two main engines for the season allowing the gas guzzling DLG to hide in the shed. [DLG also has the worst bogies at the moment so there was a desire to keep it low mileage]. Early runs in April after the work was done showed promise. Merddin was reckoned to be a freer steamer and less voracious in his demands to be fed coal. It was looking good for a busy season for Merddin. 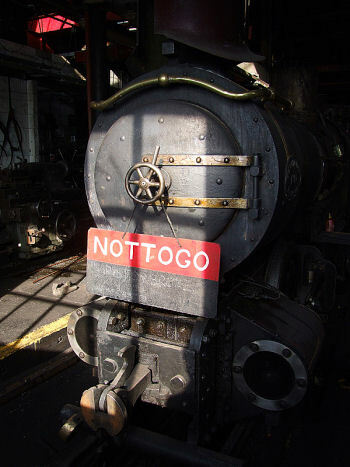 Few of us got to try it before one Friday afternoon, after being warmed up prior to working trains that weekend the residual steam was used to fill the boiler up when water was seen to be spraying out from around the dome. This failed the engine with immediate effect pending investigation. 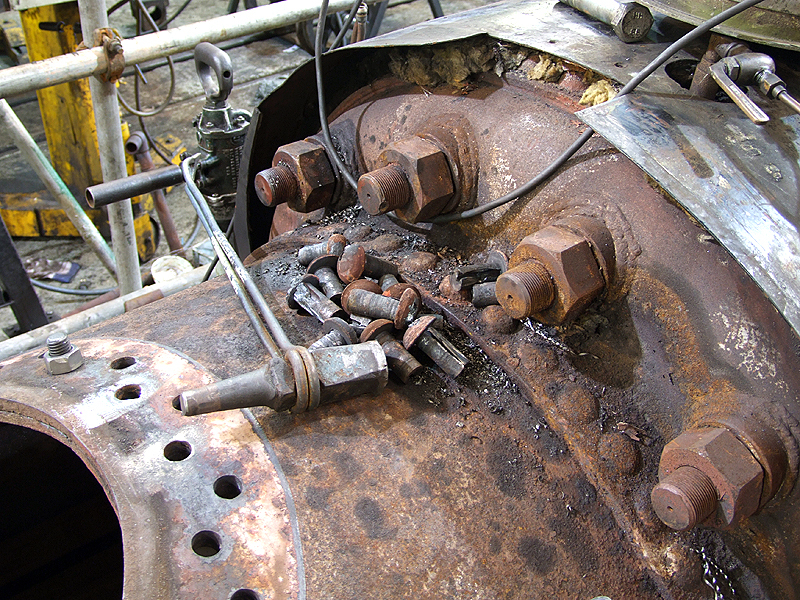 What was found was that it was leaking from the rivets that hold the dome on to the boiler barrel. There are three layers of steel here, the dome, the barrel and the compensation ring. [the compensation ring is extra steel that compensates for loss of strength in the barrel resulting from cutting a hole in it for the dome - the clues in its name]. As an added complication there are also fastenings for the palm stays on some of these rivets. What follows now is the story of the problem and its cure in pictures. The worry was that to fix the problem with new rivets the boiler would have had to be de-tubed and the front tubeplates removed to allow access. 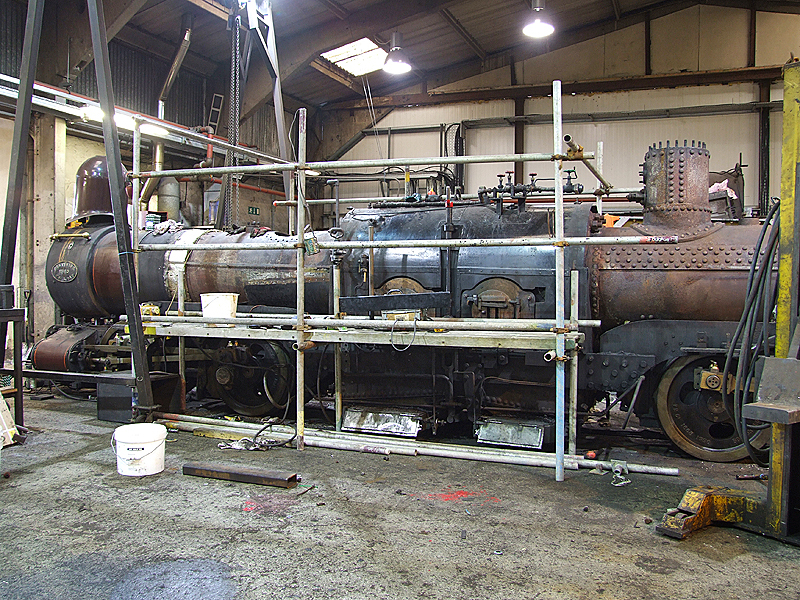 This view is included because it shows us some other views of the boiler and aspects of the repair. In the bottom left corner it can be seen that the compensation ring is now held in place with a temporary bolt. Whilst we're doing exploded views of the inner workings of the boiler here's one looking up the boiler towards the firebox. 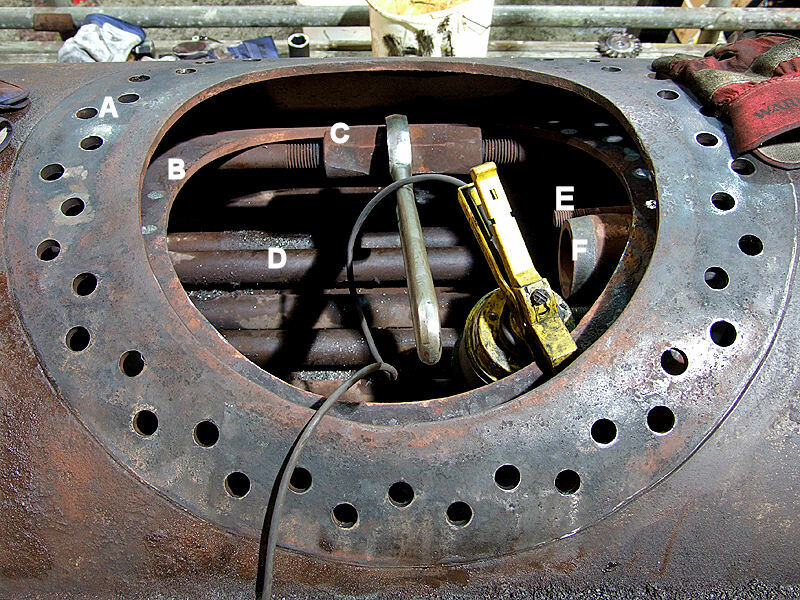 B: The two layers of the barrel and compensation ring temporarily bolted together. Fortunately, the boiler inspector suggested a way to repair the boiler without the expense of stripping the tubes out. Despite that, any repair was going be a substantial effort and need the superstructure stripping. First the cab has to be removed and then the side tank assemblies can be lifted off. This isn't a quick task but it is made easier by the new sides made (see the tank saga article when it moves to this site) in one piece and with their own lifting cradle. The repair was going to mean a lot of time spent working at height so a scaffolding work platform was erected around the engine. This view shows the bottom end dome off and being worked on. This view shows the cradle moved to the top end. The dome can be seen on the floor but hanging from the hoist. On the end of the pallet and on the floor by the trestle are the regulators. In the background and above Merddin Linda's smokebox and frames can be seen.